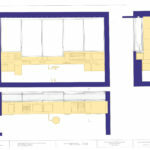 The Kitchen work center represents an example of profound re-invention of technology and aesthetics of kitchen. 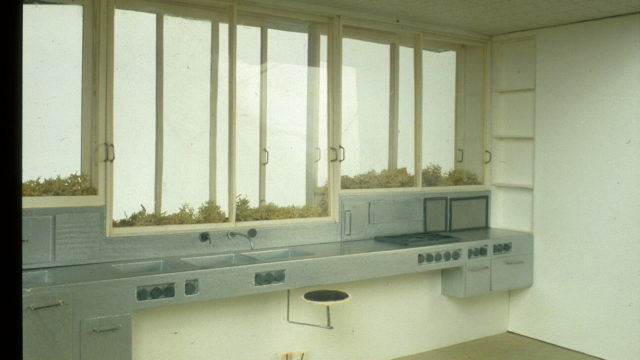 Starting from the study of the conventional process of food production, Nelson proposed a multipurpose environment consisting of a working surface under a double-paned window. All the food preparation activities are ergonomically aggregated into the three basic units: cold, water and heat. The working surface is fixed to the wall and is suspended from the ground to facilitate both the movement and the cleaning. It is illuminated by natural daylight from the large windows, and a fluorescent tube recreates the light conditions of the day at night. 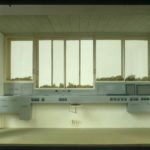 The double sliding window was designed to contain flowers and aromatic herbs.